Reality is systemic, complex and deeply interconnected. 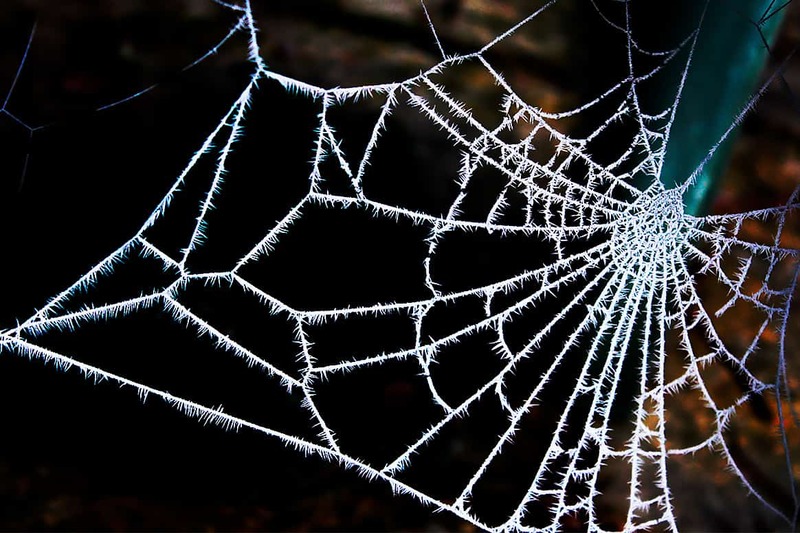 Systems are dense webs of relationship. Addressing any situation wisely requires understanding and tapping relevant participants and connections. 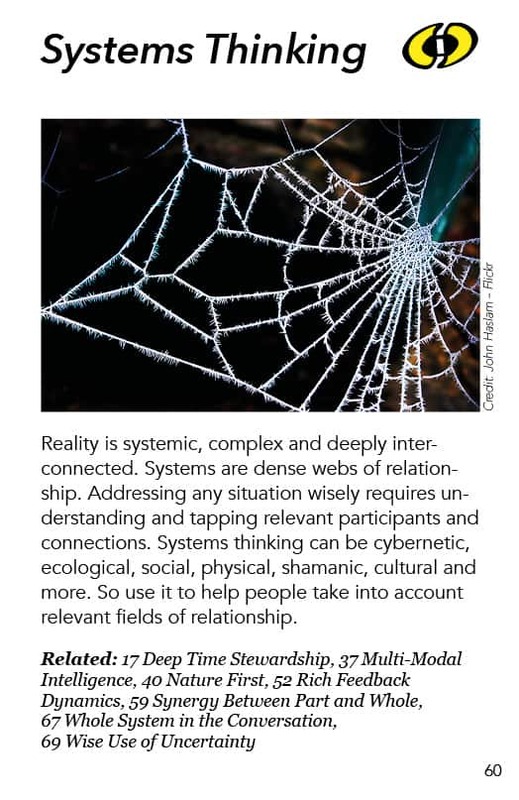 Systems thinking can be cybernetic, ecological, social, physical, shamanic, cultural and more. So use it to help people take into account relevant fields of relationship. The term “systems thinking” is used here to refer to all the kinds of thinking we can do that take seriously the interconnectedness of the world and what that means for our activities. If we want to have wise solutions, we need to realize that whatever situation we are trying to address is itself a system. There are lots of things involved within it that are interacting to generate the situation. The idea of one linear cause is an illusion and gets us into trouble. Using linear cause thinking, we come up with a linear solution. We try our linear solution out in the nonlinear real world and suddenly we discover there are “side effects”. Actually, there is no such thing as a side effect, there are only effects. “Side effects” are things that were on the side of this linear cause we thought we’d identified. So becoming sensitive to the multitude of causes and effects, relationships and dynamics going on is part of achieving wise solutions. The other part is knowing that whatever situation we are working with exists in a context of a larger world to which it is connected. Of course, ultimately we cannot track every single connection and influence in any given situation. We have to have some sense of relevance. But with systems thinking our sense of relevance gets greatly expanded. Systems thinking does not stop quickly at the most obvious levels of cause and effect. Very often systems thinking will be involved not only in understanding the problem but in designing solutions and also in getting implementation planned out and done. People may have connections you haven’t thought of which are problematic or potentially useful. For example, someone who agrees to help out solving this problem may be connected to other people who are going to prevent him or her from doing that. So you need to try taking things like that into account. The sense of who is involved and how are they connected is a big chunk of what systems thinking is about. I come to this with a much broader sense of what systems thinking is than a lot of people do. But I think most of us would agree that the main form of systems thinking – the one that is broadly recognized – is cybernetics. Cybernetics is largely about understanding feedback loops. The feedback loops that balance things out are usually called negative feedback loops. Calling them “negative” does not mean they are “bad”. They are just negative in terms of balancing things out, of moderating factors that are too much or too little. A thermostat is a standard example of that dynamic. If a room or machine gets too hot, the thermostat cools things down. And if it is too cool, the thermostat heats things up. In contrast, so-called “positive” or “magnifying” feedback loops make things more extreme. They aren’t “positive” because they are good. They are “positive” because they make things “more”, more extreme. They magnify certain trends that are happening. A commonly noticed positive feedback loop in society is the dynamic through which the rich get richer and the poor get poorer. Part of why the rich get richer is because they have money to buy government access, to buy influence with officials and to support their favorite candidates in elections, or to buy and own newspapers and magazines and other media that influence what people know and how they think about things. Wealth buys access and influence so that you can arrange the power structures to do the things you need to have happen in order to get more money. That creates a positive feedback loop until a negative feedback loop comes along in the form of Bernie Sanders or a regulator or somebody like that who says: “Stop, no more of this!“ and creates a movement or a regulation. That movement or regulation becomes a negative feedback loop, to balance out the system in some way. Another example of cybernetic systems are all the ecological feedback loops. Ecology is the study of natural systems, of so-called “ecosystems”. In an ecosystem we find different kinds of animals and plants and the relationships among them and water and land… and all these things fit together in interesting ways, influencing each other. So if there is some shift – perhaps some animal is removed from the system by going extinct – or some forest is chopped down or some somebody just builds something in the middle of that ecosystem – then something shifts in the fabric of the system. Sometimes it doesn’t have a big impact and sometimes it has massive impact – and it is not always totally clear at the start which it will be. But there is a lot we do know and we can be cautious in how we proceed with such things. So we need to be conscious of environmental and ecological systems AND we need to be conscious of social systems, politics, and economics AND we need to be conscious of the relationships between the human and the natural systems. We also need to be conscious of various physical systems like the carbon cycle and the oxygen cycle. All the atoms and molecules in the world are moving around us and through us in vast interesting ways and they have impact. Fukushima’s nuclear power plant goes down and suddenly there are all these radioactive materials moving through the system. Some of them go into the water and some go into the air… and understanding how all that works is vitally important. I recently read an article about reinforced concrete, saying it is actually weaker than regular concrete in the sense that the steel reinforcement rusts and start to crack the concrete. A lot of bridges and buildings are suffering from this. It will be really hard to put them together again. We thought that the steel made the concrete stronger and more resilient. But it’s turning into a disaster. I find myself wondering if there was some materials engineer somewhere who said “Wait a minute. What if the steel rusts? What impact will that have?” But other people thought that was a far-fetched idea and put him (or her) down and proceeded to get reinforced concrete used in almost all big construction projects. Part of systems thinking involves understanding the physical relationships between things. Engineering helps us do that. But engineers are humans and they work for humans and their psychology and the economic incentives at work in the larger social systems they’re all embedded in can distort the ideals of what science and engineering are supposed to do as part of our collective intelligence and wisdom. A lot of humility and other perspectives are in order if we want to be real systems thinkers. Which brings us to shamanic and indigenous perspectives. There is often a wall between shamanism* and science, between indigenous cultures and modern cultures. But there are some very amazing shamanic perspectives in general. Although there are very many different shamanic and indigenous cultures and practices, probably the most central shamanic cultural assumption is that we are embedded in natural systems, that these systems are alive and that we need to be in “right relationship” with them. Native Americans speak of “All My Relations” – meaning everything in the natural world – meaning we are directly related to everything that is. There is an assumption of relationship rather than an assumption of separateness. Particularly skilled shamans can sometimes look at a plant that they have never seen before and tell you what its nutritional or medicinal healing powers are. There are many skills they have used in the past in order to help their communities survive. There are more and more people studying shamanic capacities. I’m no expert in these, but when I say that indigenous cultures and shamanic practices are variants of systems thinking, I’m starting at the most basic level and that is that they assume that we are embedded in a larger living reality that we are intimately related to. You don’t need Western science or cybernetics to live in right relationship to the natural world. System dynamics are often embedded in the narratives that are built from the shamanic understandings of the world. Consider the statement that “The Earth is our Mother“ which is broadly believed in many tribal cultures. From a scientific perspective we would think of that as just a metaphor. But when you consider it carefully, it is more than mere metaphor. It has implications that cause people to behave in ecologically responsible and sustainable ways. Think about how, when we are very young, we are totally dependent on our parents, particularly our mothers. Mothers are known archetypically as nurturers and we are nurtured by nature. But we are also constrained by our parents and by nature. You don’t disobey your mother without consequences. This is a very interesting and rich narrative. I once heard that mining – the idea of digging into your Mother for resources – sickens some indigenous people. The whole idea is repugnant to them. There are taboos against that. Modern Westerners might say that that keeps those societies backward. But that is from our temporary modernist perspective. Once you start looking at what is involved, this whole enterprise of mining and metals has been a disaster for the larger enterprise of life – at least as it has been carried out by warrior cultures and mass-consumerist industrial societies. It may be working for us now, but it may well not be working so well in the near future! There may be ways to handle it which are much more sustainable and we may be learning them but I am just noting the dynamics that happen in society, in technology, when you start mining metals. What if that option had been cut off at the start by the image of cutting into our Mother to get something that we want. I am just pointing out that there is a certain wisdom in that way of looking at things, so it serves as an example of systems thinking being embedded in cultural myths, metaphors and perspectives, not just in materialist science. You can analyze that Earth-as-Mother perspective from sociological, ecological or economic perspectives and see its logic. That is why this narrative makes sense. The fact that the narrative itself has that understanding embedded in it, you don’t have to have the scientific knowledge in order to have it have the impact it has on your collective life and to generate the wisdom it has to offer. I read about a culture in Southeast Asia that had all these directions about how to deal with their system of agriculture embedded in their religious dictates and taboos. If you do this all these spirits are going to haunt you and wreck your crop. If you do this other thing, your crop will be blessed. When the scientists analyzed these myths, it turned out that this cultural structure was built to embody what was needed in order to successfully plant and grow things in that environment. Once they did an ecological analysis, all of these things could be explained scientifically. But this was built into the narrative and everybody was spooked to do things the wrong way without knowing why from a scientific sense. We can say: “Well, some of these shamanic practices and mythic beliefs are wise and some of them are really stupid.“ That may be true. But some of our own technological and scientific understandings and practices are wise and some are stupid, once you look at their impacts in the world and some of the psychosocial dynamics that corrupt their functioning. I’m just raising the idea that some traditional societies have embedded in their narratives a lot of understandings that we may or may not come to later through more linear investigative means. I’m suggesting we may not be so smart to disregard all the other things they believe, as well. I’m suggesting it may be wise to include some of those folks in our deliberations in trying to understand what constitutes wisdom for our societies, especially in regards to nature. In short, there is lots of knowledge regarding relationships built into cultural practices which should be treated with some respect before we disparage them or dive in to change them because we think they are primitive or unscientific. Given the current state of Western Civilization, it behooves us to be a bit more humble and curious. So I offer all these as examples of some of the different ways you can think systemically. In general, thinking systemically is distinct from thinking in isolated fragmented separate ways. Non-systemic thinking assumes we are basically separate and we can do what we want, we are powerful, our technology is totally brilliant, it can make X happen without y and z happening. That thinking is a sure path to some pretty bad folly. There is a level of humility that comes from thinking systemically. If we want to have wise decisions we need to take into account what needs to taken into account for long-term broad benefit. That is our working definition of wisdom in this pattern-based system of ideas. And so anything that helps us take into account relevant fields of relationship will help us be wise, by that definition. We are living in more complex human constructed systems then we ever have before in our history. And we aren’t built to naturally think our way through space and time and causality beyond what’s most immediate. So when we use our old 10,000 year old senses and perceptions and ways of thinking, we often miss the fullness of reality, especially because our environment is nothing like the one we lived in 10,000 years ago. We don’t see lots of things that are going around us that will impact us – from radiation to microorganisms to climate change – because we are not built to. We build technologies and sciences to perceive and understand these things for us, like the computer models that track climate change. But we often don’t know about or can’t even comprehend what these “extensions of our senses” are telling us – individually and even collectively (at least in our politics!)! Furthermore, the complexity and ubiquity of technologies and complex social systems make it hard to see the impacts of our actions through the webs of interconnectedness. The money we put in our bank or credit union is going in all sorts of different directions and areas about which we have no idea. It takes experts to know the nuances of systems and to help us understand what is actually going on in an issue that we are wrestling with. Most ordinary people’s intuitions are not informed by systems thinking. At least in Western cultures, we tend to experience life as if we are a separate entity, and if we sense our connectedness, it is usually with those immediately around us or related to us. We don’t have a good sense of long-term or distant connections or the complex web of life we are embedded in and so dependent on. When we choose experts to advise us in our deliberations about public issues, we should make sure we include people who are systems thinkers and are familiar with the systems involved with whatever we are dealing with. They should be invited to speak to us and interact with us to help us understand what the impacts of our decisions are likely to be and how to effectively deal with the situations we’re studying. They need to be accessible and articulate in fields like cybernetics, ecological systems, social systems, system dynamics and, yes, indigenous perspectives. It would be great to have these as expert witnesses in citizen deliberative councils including wisdom councils. * Some anthropologists have noted that “shamanism” is a misleading term, denoting an ideology, whereas a shaman is stewarding collective knowledge, performing practices and playing certain roles in their community and ecosystem, such that “shamanhood” or “shamanship” might better convey the essence of this realm of study and practice. There is so little directly in the field of dialogue and deliberation and I think that is sad. I guess one of the main ones we already know about is computer modeling for climate understandings. So for me in general I have advocated for a while having people involved who understand, are accessible and articulate in any of these fields cybernetics, ecological systems, social systems or system dynamics. It would be great to have these as expert witnesses in citizen deliberative councils including wisdom councils. People’s intuitions are often not informed by systems thinking. We tend to experience life as a separate entity, and if we sense our connectedness. it is usually with the immediate connections around us. We don’t have a good sense of long-term or distant connections or the complex. Constellations work, Social Presence Theater, and Warm Data Labs are interesting examples of efforts to give participants a visceral sense of the interconnections between different parts and dimensions of living systems. What a fabulous resource, Tracy!! I’ve added it to the resources list on this page.